Technology Review: Is Defeating Aging Only a Dream? Is Defeating Aging Only a Dream? No one has won our $20,000 Challenge to disprove Aubrey de Grey's anti-aging proposals. Last year, Technology Review announced a $20,000 prize for any molecular biologist who could demonstrate that biogerontologist Aubrey de Grey's "Strategies for Engineered Negligible Senescence" (SENS) -- a much publicized prescription for defeating aging -- was "so wrong that it was unworthy of learned debate." The purpose of the challenge was to determine whether de Grey's proposals were science or fantasy. The judges of the "SENS Challenge" were Rodney Brooks, the director of MIT's Computer Science and Artificial Intelligence Laboratory and the chief technology officer of iRobot; Anita Goel, the founder and chief executive of Nanobiosym; Vikram Kumar, the cofounder and chief executive of Dimagi and a pathologist at Brigham and Women's Hospital in Boston; Nathan Myhrvold, the cofounder and chief executive of Intellectual Ventures and the former chief technology officer of Microsoft; and J. Craig Venter, the founder and president of the Venter Institute, whose computational methods hastened the completion of the Human Genome Project. We received five submissions, of which only three met the terms of the challenge. De Grey wrote a rebuttal to each qualifying submission, and the challengers wrote responses to those rebuttals. The judges considered all these documents. In the end, the judges felt that no submission met the criterion of the challenge and disproved SENS, although they unanimously agreed that one submission, by Preston W. Estep and his colleagues, was the most eloquent. The judges also noted, however, that de Grey had not convincingly defended SENS and that many of his ideas seemed somewhat fanciful. "At issue is the conflict between the scientific process and the ambiguous status of ideas that have not yet been subjected to that process. "The scientific process requires evidence through independent experimentation or observation in order to accord credibility to a hypothesis. SENS is a collection of hypotheses that have mostly not been subjected to that process and thus cannot rise to the level of being scientifically verified. However, by the same token, the ideas of SENS have not been conclusively disproved. SENS exists in a middle ground of yet-to-be-tested ideas that some people may find intriguing but which others are free to doubt. "Some scientists react very negatively toward those who seek to claim the mantle of scientific authority for ideas that have not yet been proved. Estep et al. seem to have this philosophy. They raise many reasons to doubt SENS. Their submission does the best job in that regard. But at the same time, they are too quick to engage in name-calling, labeling ideas as 'pseudo-scientific' or 'unscientific' that they cannot really demonstrate are so. "We need to remember that all hypotheses go through a stage where one or a small number of investigators believe something and others raise doubts. The conventional wisdom is usually correct. But while most radical ideas are in fact wrong, it is a hallmark of the scientific process that it is fair about considering new propositions; every now and then, radical ideas turn out to be true. Indeed, these exceptions are often the most momentous discoveries in science. "SENS has many unsupported claims and is certainly not scientifically proven. I personally would be surprised if de Grey is correct in the majority of his claims. However, I don't think Estep et al. have proved that SENS is false; that would require more research. In some cases, SENS makes claims that run parallel to existing research (while being more sensational). Future investigation into those areas will almost certainly illuminate the controversy. Until that time, people like Estep et al. are free to doubt SENS. I share many of those doubts, but it would be overstating the case to assert that Estep et al. have proved their point." of a legitimate engineering process." Craig Venter most succinctly expressed the prevailing opinion. He wrote, "Estep et al. in my view have not demonstrated that SENS is unworthy of discussion, but the proponents of SENS have not made a compelling case for it." In short, SENS is highly speculative. Many of its proposals have not been reproduced, nor could they be reproduced with today's scientific knowledge and technology. Echoing Myhrvold, we might charitably say that de Grey's proposals exist in a kind of antechamber of science, where they wait (possibly in vain) for independent verification. SENS does not compel the assent of many knowledgeable scientists; but neither is it demonstrably wrong. The full versions of all three submissions to the SENS Challenge, with full citations and footnotes, can be found below. Estep et al. strongly disagreed with the judges's opinion. Read their dissent here. The winners are donating the entire $10,000 prize to the American Federation for Aging Research. We've picked the judges for our biogerontology prize. 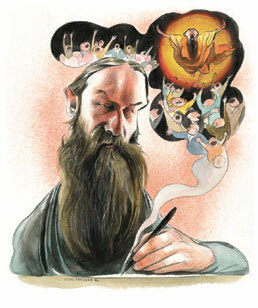 Aubrey de Grey thinks he knows how to defeat aging. He's brilliant, but is he nuts? When technology appropriates the transcendental it becomes science fiction. Massachusetts Institute of Technology © 2019 Technology Review. All Rights Reserved.